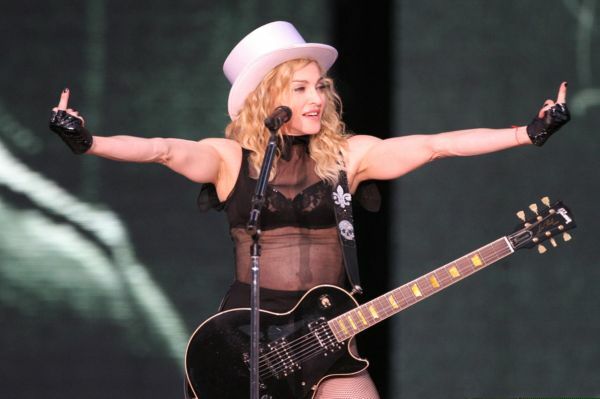 Break out your lace gloves: Madonna’s 2012 world tour kicks off in Tel Aviv on May 29. The Material Girl will follow that date with a gig in the City of Brotherly Love on Aug. 28. She will play Quebec Sept. 1, Ottawa Sept. 10 and Toronto Sept. 12. Start snagging tickets, Pop aficionados: Madonna‘s world tour will kick off in Tel Aviv, Israel on May 29. Following her much talked-about Super Bowl performance on Sunday, the Queen of Pop has revealed the dates for her globe-trotting 2012 series of shows on Tuesday morning. The 53-year-old will cover close to 90 dates in her first trek around the planet since her $408 million-grossing Sticky & Sweet Tour, which followed the release of her 2008 album Hard Candy. “The shows will include arenas, stadiums and special outdoor sites including the Plains of Abraham…The tour will stop in 26 European cities including London, Edinburgh, Paris, Milan and Berlin,” according to an official press release. The North American leg of the tour will commence in Philadelphia on Aug. 28. And in another bit of exciting news for fans, the Material Mom of four will play South America and Australia for the first time in 20 years. Live Nation will be promoting the tour. Tickets are scheduled to go on sale beginning Feb. 10 for shows in Tel Aviv and the United Kingdom. Tickets for North American dates will hit the market on Feb. 13. The announcement of the “Borderline” superstar’s latest world tour follows an extraordinary week of world records for the musician. Madonna’s halftime performance was seen by an estimated 114 million people; an even higher average than the game itself. The 12-minute pop spectacular was the most-watched Super Bowl halftime entertainment show on record, according to Nielsen Co.
Madonna released “Give Me All Your Luvin’” as the first single from her upcoming album, M.D.N.A., on Friday, to the twit-citement of her pop counterparts. “Madonna — amazing performance last night! LUV you,” Britney Spears wrote on her profile. “MDNA era>>>>>>>>>>>>>I’m here for it tbh! Madonna referencing herself is the ultimate F**K YOU! Hehehe,” Rihanna added.